As you seek to rise to the next level — whether that means a new job, a challenging promotion, an entrepreneurial venture, or a whole new direction — you’ll find that the skills and approach that made you successful need to evolve. What got you here won’t necessarily get where you want to go. In fact, the very behaviors that have served you well in the past may be in your way. 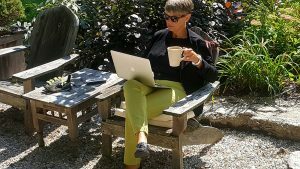 Gold standard women’s leadership expert Sally Helgesen and coaching legend Marshall Goldsmith have each helped thousands of high achievers to reach greater heights and enjoy more satisfying careers. They know the unique strengths women bring to the table. But they have also watched common behaviors trip even the most talented women up. Now, drawing on decades of stories and insights, Sally and Marshall have combined their expertise to identify the twelve most common habits that undermine women in their quest to become more successful and create careers that are satisfying and rewarding. These include: Reluctance to Claim Your Achievements; Expecting Others to Spontaneously Notice and Reward Your Hard Work; Overvaluing Expertise; Building Rather than Leveraging Relationships; Failing to Enlist Allies from Day One; Putting Your Job Before Your Career; The Disease to Please; The Desire to be Perfect; Speaking While Emotional; Minimizing; Ruminating; and Letting Your Radar Distract You. Building on Marshall’s classic bestseller What Got You Here Won’t Get You There , but adapting its premise for women, How Women Rise will help you identify what’s holding you back and offer solutions so you can clear your path going forward. How Women Rise will have you jumping out of your seat while exclaiming, “That describes me! That’s exactly what I do!” while offering you a clear and powerful path forward. 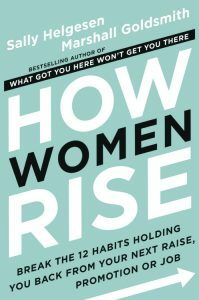 Click here to download a free reader’s discussion guide for How Women Rise. A gem and a revelation. If you lead women, work with women, are a woman or know any women, you must read this book. Its sage and sane wisdom points the way to a life of genuine purpose and meaning.